15 August 2016 – Pictured below are the most recent PWOR members to graduate at ATC Meaford. Two Regimental Officers completed Basic Military Officer Qualification Army (BMOQ-Army) and five soldiers completed Development Period 1 – Infantry (DP1- INF). HLCol Jordan and RSM MacKenzie attended the ceremonies to congratulate the members on their accomplishments. All seven graduates will find themselves with increased responsibility and will showcase their newly developed leadership and individual skills when they return to Amiens Company in September. 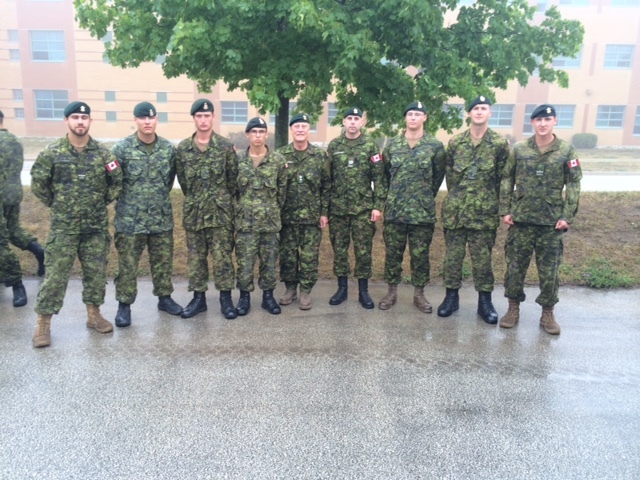 (L-R) OCdt Murray, Pte Langille, Pte Morton; Pte Ramey; HLCol Jordan, MWO Mackenzie, Pte Stevens, Pte Reid, OCdt Lyons.